This interview originally appeared on the Library of Congress’ The Signal on October 27, 2016. 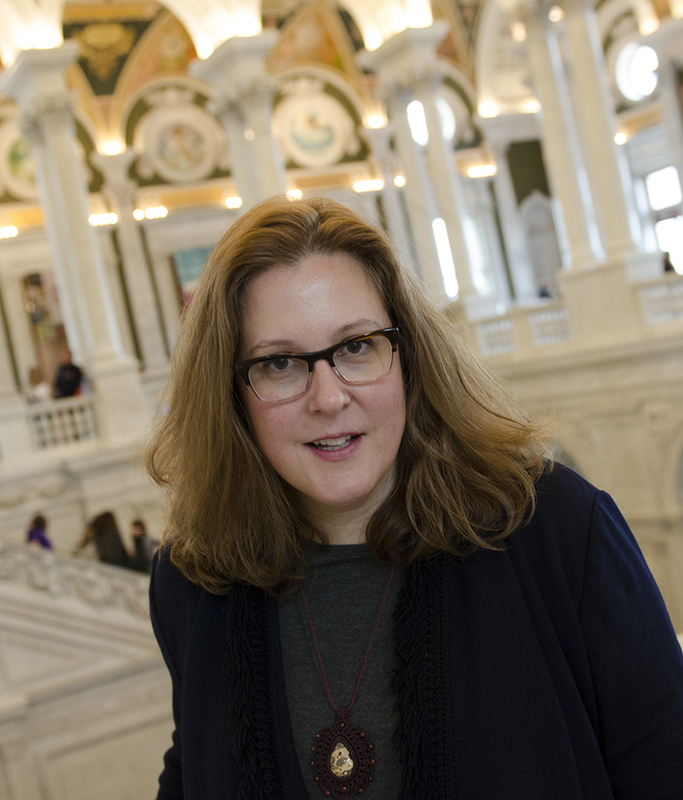 Natalie Buda Smith is the User Experience (UX) Team supervisor at the Library of Congress, and most recently worked with NDI to design the beautiful graphic for ourCollections as Data conference. Her team has been busy redesigning Loc.gov, and the new homepage is set to debut Tuesday, Nov.1st. We caught up over coffee to discuss user experience (UX), storytelling, the importance of design thinking in libraries, and Black Sabbath. Can you tell me a little about your background and what you do on the User Experience Team? User Experience is hard to define, but you know it when you see it. It is making things easier for people to use and understand. In our case, loc.gov, congress.gov and a handful of other digital products. It wasn’t called User Experience 20 years ago or even ten years ago, it has been called Graphic Design, Information Architecture, Interaction Design, Web Design and now also Customer Experience. The profession has changed dramatically just like Library Science has changed dramatically. I actually have an undergraduate degree in film from UNC Chapel-Hill, so I was very interested in not only design but storytelling and interactivity. You wouldn’t necessarily think of film as a good background for interactive work, but timing is just as important as color, content, and composition. Back when I started out, the most popular type of IT job was in computer networking, and my first job out of film school was designing system diagrams where I described LANs, WANs. I had to learn the difference between a router and a brouter, and started to understand computers and networks. This gave me a good foundation for the technology that is used today. So then I went to design school at North Carolina State University and got my Master’s in Design, and then I decided I wanted to teach. For six years I taught around the world. The last teaching job I had was in Beirut, which was amazing, because their sense of aesthetics is so different from the Western one taught in school. In Arabic, you read from right to left and the letters are so dramatically differently, it makes you look at the world differently. What were you teaching people to do? I was very lucky to be able to teach design thinking, the design process, how to solve a problems through creative approaches. In some schools, User Experience or Graphic Design is treated as a vocation, but there are many schools out there that understand how effective design thinking can be. I was able to put together and teach a curriculum that would break down students’ assumptions about design, aesthetics, problem-solving, and then build it back up to a more creative, systematic way to approach problem solving. And often it could take many forms — print, photography, film, multimedia, the beginnings of the web — but I focused on fundamentals of thinking. Beirut was fascinating because my students, between 18 and 23, spent most of their life in civil war, so this was an opportunity for them to be creative, and bring their own storytelling into it, so it was not just about pushing Western aesthetics. Some of these kids spent many years in bomb shelters, a large part of their time underground in basements, so it was an interesting perspective of the world. Storytelling is so important. It’s one of the reasons I got into this job and I think many archivists and librarians feel the same. Where does design and storytelling come together in the UX field? To me User Experience is about structuring things so they are more accessible and consumable, but it also about breaking down problems and understanding what are the many ways to approach it. It’s like having a new set of tools. Take any sort of raw material — be it data, be it photographs — and then think ‘how do I assemble this in a way that tells that story? How do I structure it? Maybe I can transform it in some way?’ And then to understand when you do transform, there’s other layers of meaning that’s added on. When you take a set of photographs and put them in an order, the order tells as much of a story as the individual photographs. That’s fundamental to design thinking. I would not say that only designers do design thinking, not only artists do creative thinking, librarians, engineers and others do a lot of creative thinking too. Design tends to use framework of systems that art doesn’t have to. Art can be a little bit more free from systems, where design typically has to function in some way, whereas art can be aesthetically pleasing just for its own self. Librarians are systems thinkers, but there’s a need for design thinking skills that you don’t find in a traditional library education. How would it help us? Good design programs spend a year or two breaking down your perceptions, and that’s really important. Design thinking is not just about empathy- you hear a lot about empathy for your users or customers – but it’s also a skill, and it’s a journey to get there, if you can break something down and remove yourself from it — get to the real problem and not feel that the solution has to conform to what you initially expected. Really good design thinking is when you’re able to remove yourself from the problem and put yourself into the user’s shoes. It’s a bit like acting; a really good actor can transform into someone completely different. Let’s say you’re on a group project and you have a really interesting problem to solve and you’re working on a solution. People get emotionally invested — ‘this is an expression of myself, this is what I think, this is what I believe!’ — and the good thing about UX is we have tools to bring the user in to confirm or deny how they understand the problem. A really good designer can recognize ‘I’m emotionally invested in this, why? Let me try to remove myself.’ We learn this through constant peer feedback, and in design school, the critique. It’s one of the most stressful things for design students, when you take your work and put it on the wall and you have thirty people staring at it and telling you if it’s good or not good and you have to stand up there and defend it. In design school, this happens weekly, if not daily. By the time you end school, if a project team gives you negative feedback, you don’t feel defeated, you say, ok, let me try again because I didn’t hit all the things I needed to get done. It’s less about my personal expression and more about the solution. I haven’t seen this practice of critique used a lot in other fields. Yes, there’s a movement in our field to expose our work to critique, to show our failures as well as our successes. It seems that designers have understood this for a while, that that’s how you improve. The Library of Congress is special because they have you and your staff of UX professionals in-house. What kinds of UX designers work best in a library environment? In the Library, because our projects tend to range in size and type of content, I find that you need UX designers that are really well-rounded. You need someone who has a strong visual aesthetic, who knows how to code, someone who knows user research. The people we have at the Library are more experienced because we need that well rounded skill set. I’ve been doing it for over twenty years, and on average the people on the User Experience team at the Library have been doing it also for fifteen, twenty years. You’re exposed to all of these different facets of UX when you have more years of experience. So if someone said to me, who would I hire internally at a library, I would go with someone who was more well-rounded and knows when something is needed versus being really, really good at one particular flavor of UX. This is my first internal federal job. I spent the majority of my career in IT consulting. In consulting, we would get really large website redesigns, where for example, defining the user experience could take eight months, two years with a dedicated team of eight user experience professionals dedicated to the one project. Here we juggle a lot of projects at once. We’re going through a major UI update to loc.gov, with a homepage redesign, then we have congress.gov which is has several sophisticated searches, then we have all these other, smaller things like iBooks and the heritage websites which takes a lot of interaction with other government agencies. It’s all these projects, small to large at the same time. It’s amazing how many UX positions are being advertised right now in the federal space, people are starting to understand the value of making products easy and enjoyable to use. Is there anyone that has made a career out of UX design in libraries that you know of? There isn’t a guru we could point to, no. There are several people who are solving interesting problems also, like at New York Public Library and other universities, but no one who has built a User Experience career out of it. People at my experience tend to have a lot of e-commerce experience since that was the driver for so many digital products, so as libraries continue to transform, the expertise will grow. Someone who’s coming out of school right now may be that person, but the opportunities haven’t really been there yet, in the way that it’s been there for e-commerce. How would a librarian make an argument to their administration about hiring a UX designer? I’m going to start with the technologies. The mobile device. Over 30 percent of our traffic on loc.gov comes through mobile devices. More and more people want to view library content on their mobile devices. One thing that UX can assist with is that you can’t put the entire website on the mobile experience — the former desktop experience does not transfer one to one — the technology needs to be updated, it needs to be made more accessible, and also the experience is very different. The context of how you’re using online content can be just as important as going to the site itself. I think of accessibility. A lot of technologies that we use to make content or collections more accessible online also make it more accessible for other technologies. When you make it more accessible you also make it more flexible, more scaleable, so as new technologies come online and people adapt to them, you are able to migrate it. Then search. Search is more than just a framework, it’s also about knowing how people search, and the context of searches, what do people expect from search. So User Experience professionals can help define how users expect search to work, not just how to make search function. We have a web metrics team with two people, and they provide a lot of great user behavior data for us, so we know that people want this item or that item, we can see the paths that they’re taking through these websites. Why not take what they want and move it up higher in their path? From a pure Library Science point of view, catalog prioritization may not match what users tend to want, so there’s some reconciliation there that needs to happen sometimes. One tool set we also have is user research, and that can include older methods such as surveys or ethnographic studies, moderated testing, live site testing, but then it’s also applying metrics. A lot of times the best understanding of users is not just through one method — you have to use multiple tools and build a holistic understanding about users and what their motivations are, what they really want, and then constantly check back because it constantly changes. What people wanted last year is not going to be the same as what they want this year. Can you talk about Project One, the Library’s effort to redesign its website? The challenge for the Library is that it was such an early adopter of the web.The Library started early creating websites for people to have access to this wonderful content, but in a way that is now a burden. That’s similar to something I learned in Beirut. My students were showing up to class and they had beautiful cell phones, I’d never seen state of the art cell phones like the ones they had, but I couldn’t make a landline phone call. What had happened is they had just jumped over several communication technologies. Why would they install landlines in Beirut, just go mobile. It’s sort of the same burden we have at the Library. So much work, so much content was put online early with older technologies, and now we have a lot of re-work to do. We have to pull up those old landlines in order to make them cellular friendly. Project One is very iterative. It started off as a concept, how do you build a framework that’s optimized for search, breaking down content to the object level. Everything was flattened with metadata to assist search. It sounds simple but it’s not and it wasn’t. The most basic element is the item, but that in itself is complex because what is an item? Is it a book? Is it the page of a book? You need someone to decide that it’s worthy to apply metadata to it. We’re continuously learning and changing. No longer are you browsing web page by web page, and that was the basis of Project One. Now we’re trying to build other structures on top of that foundation of search because people are wanting to create and consume context for the collection items. They’ll find an item and want the meaning around it, or we want to take this amazing content and package it in different ways for specific audiences. So that’s where we are right now. We’re moving to the stage of — how do we do more storytelling? How do we take all of these wonderful elements and start to tell stories in a more engaging way? And the home page is really a great step in that direction, because what we’re trying to tell is that the Library is more than just a collection of things in specific subjects. Let’s start to tell stories about what’s there because that’s the most engaging way to get people interested and understand that this amazing content is a part of the American story. Even if you try your hardest to build the most perfect and graceful system, it’s not going to be simple, because the items we have are not all the same. We’re not making widgets. For example, take our wax cylinders, books, and then periodicals, photographs, audio, how do you jam those very different forms of content in the same structure? Just in order to make search work you have to have a framework, but it is challenging since there is also so much context around it that if you start to treat everything as the same, you lose a lot of information, so it is very challenging. What was a takeaway for you from the Collections as Data conference? I was excited to see the creativity that was being promoted. It’s one thing to talk about data and the best structures for data, but the majority of the conference was about creativity, and what people were doing with data. There was a variety of people doing different things. At the Library, we promote our collections, but having these outsiders present, you start to see oh, there are other ways that you can use the collections and that was exciting. There may be some people who see the Library more as a literal preserver of things, but the new approach is to see that preservation is in making it more accessible. If you want to preserve something, make it available, and when others make more things out of it, it is preserved in a richer way than if it’s just locked away for no one to see. What was the inspiration behind the Collections as Data conference graphics? When thinking about the essence of the conference — laying down a influential foundation for the discussion of collection data and the creativity of its potential, I was reminded of a Black Sabbath’s album cover for one of the most influential albums in heavy metal music. I distilled the artwork to its most basic elements then created a visualization of its most elemental forms and colors. It thought it only fitting as the National Digital Initiatives team are in their own ways the rock stars of data. That’s amazing! Thank you! If a library is updating its online presence, what are the top three things they should consider as a part of their design process? The first thing is authenticity. One of the things we’re continuously working on at the Library is how we make our content accessible for education. We did some user research with that audience, conducted a focus group with elementary students, which was so much fun. It was a three hours long, but we learned a lot. We did a lot of different activities, but the main activity was to have them conduct research online. I asked them to pick someone famous like Rosa Parks, and show me how they researched. And the majority of the kids, guess where they went first? Where was their starting point? YouTube. Part of user research is that you step back and you don’t influence, and these kids, they were on laptops, iPads, one was on a desktop, and the majority went to YouTube to research. 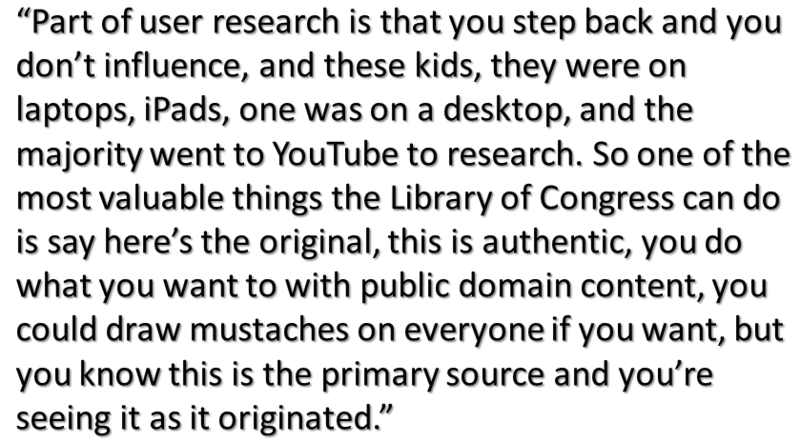 So one of the most valuable things the Library of Congress can do is say here’s the original, this is authentic, you do what you want to with public domain content, you could draw mustaches on everyone if you want, but you know this is the primary source and you’re seeing it as it originated. That’s something Libraries can do from a user experience perspective, is make sure that content is presented in a way where users recognize that it is authentic. Another thing to consider is a robust search, making sure search is easy to use and people understand what they’re getting back in their results. What’s available, what’s not available, and helping them with refining searches. The collections we offer are so complex, but people want things to work like Google. And the last thing is joy. Helping people enjoy using libraries. I think sometimes we get too focused on the technical aspects, that this has to provide x, y and z. But if you can instill a love of learning and a love of research — to me they’re the same, then you are making the world a better place. So joy is a big part of it, and I don’t hear that goal often enough. That sense of accomplishment is joy.